The hares are being hunted in the forests by other animals and they don’t know where they should go. Whenever they see any animal that come near them, they would be panic and run off to a hiding place. One day, the hares saw a group of horses running about. 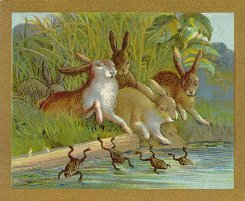 The hares were so scared and upset about it that they decide to drown themselves by the lake rather than living in fear every day. Just as they were about to go down into the river and drown themselves, the frogs came rushing into the lake and were drowned. There is always someone who have bigger problem than the problem we are having.